At Landstar, you choose the loads that meet your specific business needs. You go home when you want and load out when you're ready. Landstar is 100% owner-operator and 100% committed to your success. 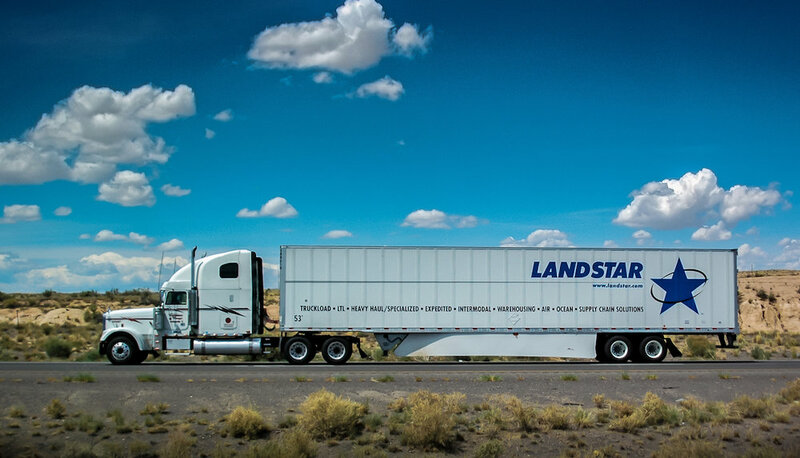 Landstar is a non-forced dispatch company comprised 100% of owner-operators pulling either their own trailer or a trailer provided by Landstar. Each Landstar owner-operator has the freedom to choose the loads they haul and when and where they operate. This level of freedom and Landstar’s percentage pay model allow owner-operators to make very good living. In 2015, the average gross revenue per truck was $178,000. Landstar pays promptly with no holdback. Once a week, Landstar owner-operators receive percentage-pay settlements for loads delivered over a period of one week ending approximately three days prior to the designated settlement day. Instead of chasing more miles to earn more money, Landstar owner-operators receive a generous percentage, 65-75% of each load they haul. Since they choose their own loads, Landstar owner-operators can maximize their full earning potential, and when rates increase, so does owner-operator revenue. Landstar has over 1000 independent sales agencies presenting and quoting Landstar freight services to organizations and government agencies throughout North America. Once an agency receives a truck request, they post it on Landstar’s load board, which Landstar’s entire owner-operator fleet can see. Each Landstar owner-operator can access the load board and perform a load search query filtered by location, equipment type, desired destination, desired rate, weight, dates, and several other factors. The result is a list of available loads within the search parameters and all the owner-operator has to do is call the agency to book it. LCAPP is a program exclusive to Landstar owner-operators which provides discounts on fuel, tires, and a variety of other business expenses and equipment. With 9,000 owner-operators in the Landstar system, Landstar uses this buying power to secure valuable discounts to improve its operators’ bottom line. Learn more about LCAPP. Landstar Appreciation Days: One way Landstar says “thank you” to its owner-operators is during Landstar Appreciation Days, an annual three-day celebration with catered meals, contests and prizes. And by prizes, they even give away a brand new tractor! Landstar Million Mile Safe Drivers and Landstar Roadstars All-Star Celebration: To celebrate the accomplishments of Landstar owner-operators who stand among the safest in the industry, Landstar hosts a first-class appreciation event at a posh resort. Entertainment, prizes, and gourmet meals fill the schedule during this time of appreciation and fellowship. Safety Awards: Landstar generously hands out safety awards distinguished by the level of service, from free gifts to a free cruise! Landstar’s load alert technology works in conjunction with its load board. Landstar owner-operators set their load alerts to exactly the type of load they desire to take. Desired origin, destination, rates, dates, weight, trailer type, and several other filters can be entered into load alert settings. Once a load matching the owner-operator’s preferences is added to Landstar’s load board, a voice message is sent to the owner operator notifying them of the available load. So, while the owner-operator might be driving, Landstar’s load alert system is working to find their next load. All freight bills include a fuel surcharge, which is determined weekly based on the market price of fuel. 100% of fuel surcharges are passed onto Landstar owner-operators. In 2015, with the cost of fuel at historically low levels, Landstar passed onto its owner-operators nearly $170 million in fuel surcharges. Landstar owner-operators pulling platform trailers with loads requiring a tarp receive 100% of the tarp fees, which typically range between $100 to $400 per load, depending on the scope of work. Once a Landstar owner-operator books a load, they can have up to 50% of the load’s revenue advanced to them prior to loading. Landstar’s revenue advance program improves owner-operator cash flow and gives them piece of mind. Landstar BCO Jenny Simpson shares her personal perspective of leasing with Landstar, including non-forced dispatch and how the Landstar system work for her. Appreciation ceremony for Landstar's newest Million Mile Safe Drivers. Landstar's orientation program is dedicated to helping you run a successful, profitable business. We think it will be like no other orientation you've experienced before. Each Landstar owner-operator is called a Business Capacity Owner, BCO, as each driver is essentially a small-business owner. Each new Landstar owner-operator attends a two-day orientation, with one day devoted to the topic of running a profitable, successful business. Spouses, significant others, and business partners are encouraged to attend. After orientation, BCOs are assigned a BCO advisor, a Landstar corporate employee trained to assist and advise them in all aspects of their operation. We'll send an information packet to your email or postal mailbox. Direct link to Landstar's online application. The next 20 minutes could change your life! Call 913-341-5858 to speak with a Landstar Recruiter about your situation and goals. Read Landstar's full list of Owner-Operator Requirements.